It had been a long day when I dragged myself to Le Poisson Rouge to see Chrysta Bell. I wanted nothing more than a glass of something strong, a seat with a good view of the stage, and a high quality musical performance. 18 year old Scottish whiskey? Check. A comfortable table near the front? Check. A show that made the day disappear and the night feel special? Sadly, my third wish wasn't granted. What piqued my interest in Chrysta Bell was her ongoing collaboration with David Lynch. They write songs together and he produces her music. Mr. Lynch has a way with finding beautiful women and shaping them into something marvelous. 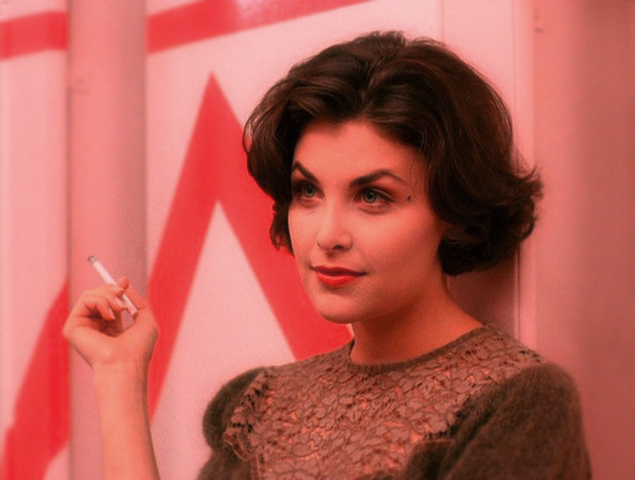 Sherilyn Fenn in Twin Peaks being just one example (and a favorite of mine). I'd watched a couple of her videos and figured, "Why not? She's gotta have something." Chrysta took to the stage after a prerecorded introduction from Mr. Lynch. He basically gave his stamp of approval with some humorous praise about her singing like a bird and being a one of a kind talent. She looked stunning. Long arms. Gorgeous skin that seemed to glow. Hair like she just stepped out of a high end salon or a shampoo commercial. High heels at the bottom of her long legs and a tight dress clinging to her curves. I mean, Chrysta was awfully nice to look at. Sadly, her beauty far outshone her music. Over the course of her set, which was around an hour and fifteen minutes, there were a couple of songs that really worked. Everything else was awful. I mean, at one point, I was shielding my mouth to muffle the laughter. Her voice wasn't her undoing. She has a more than capable voice that at times reminded me of Beth Gibbons from Portishead. It was her strangely awkward stage presence and boring songs that did her in. The photo above shows Chrysta singing through a sheer fabric she'd pulled over her head. I'm sure she meant it to add a sense of mystery to the song. Unfortunately, the band looked like they were falling asleep and the music never strayed from a super simple, disconnected lullaby. She cooed into the mic looking like ET in his Halloween costume and mystifying no one, at least not in the way she'd hoped. I knelt near the stage to take this shot and promptly made my way to the back of the place where I could chuckle discreetly. I don't feel good about skewering Chrysta's show. I am always on the side of performer. I'm the guy who gives 4 star music the 5 star stamp. Over the years, I've been around a lot of musicians and made some music myself. Creating something and performing it for people is commendable, no matter the outcome. To her credit, Chrysta was appreciative of the audience, surprisingly humble, and gave a good effort. Hopefully, she and David can find some magic as they continue to collaborate. It could happen. One of the only highlights of the show was a new number they just wrote that hasn't been released. It was dark, melodic, and beautiful. Sadly, over a third of the audience had already pulled the chute and floated out into the night when she performed it. Me? I stayed til the end. On the way home I stopped into a little diner near West 4th. Diane, I tell ya, if you ever find yourself a stone's throw from the Blue Note, do yourself a favor and find this little hole in the wall. Their pie is outrageous and they make a damn fine cup of coffee. Oh, and keep an eye out for the Log Lady.